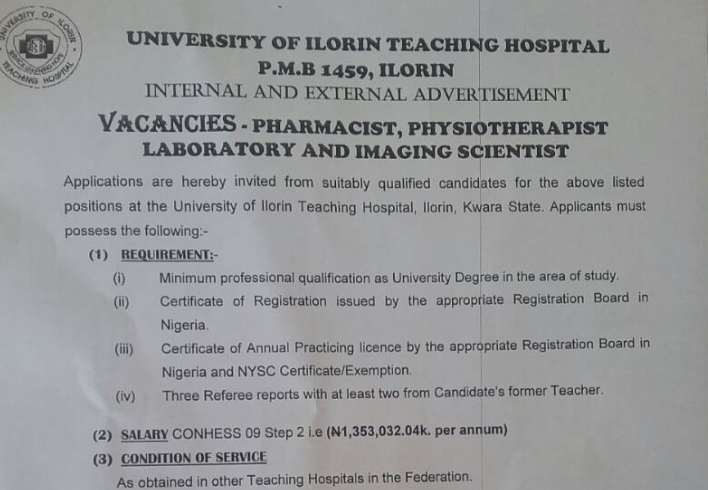 University of Ilorin Teaching Hospital (UITH) invites suitably qualified candidates for the post of Pharmacist, Physiotherapist, Medical Laboratory Scientist and Imaging scientist at the University of Ilorin Teaching Hospital, Ilorin, Kwara State. Minimum professional qualification as University Degree in the area of study. Certificate of Registration issued by the appropriate Registration Board in Nigeria. Certificate of Annual Practicing Licence by the appropriate Registration Board in Nigeria and NYSC Certificate/Exemption. Three Referee reports with at least two from candidate’s former Teacher. Salary CONHESS 09 Step 2 i.e. (₦1,353,032.04K. per annum). As obtained in other Teaching Hospitals in the Federation. The free application forms are to be downloaded from the University of Ilorin Teaching Hospital website (www.uith.org), pay the sum of Five Thousand Naira (₦5,000.00) non-refundable assessment and processing fee into UITH CBN ACCOUNT at any bank through e-payment gateway REMITA.